2912 GeF.Heft Switzerland - very nice inventory from 94 gift booklets respectively gift books from the fifty and sixties years, thereby many interesting and popular issues, often in sets of blocks of four unused respectively with centric postmarks, perfect for liquidation, favorable! (former starting price: 500,- €). 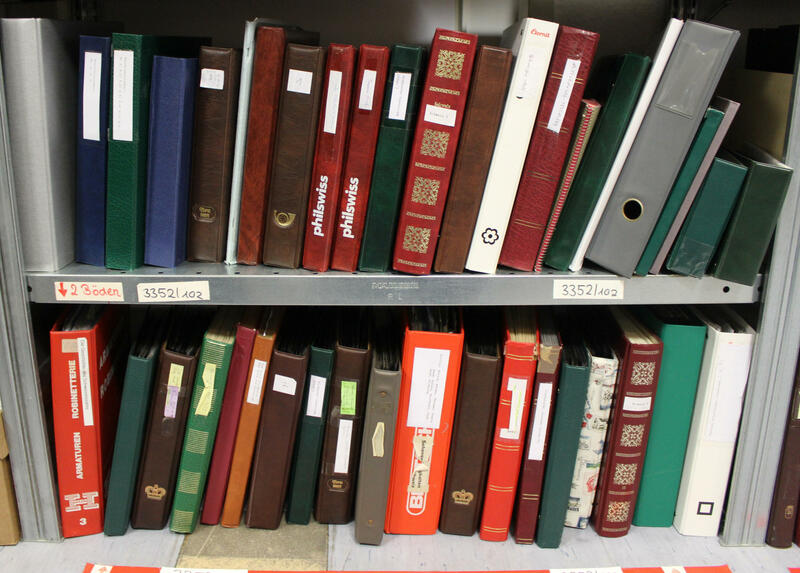 3352 rack Switzerland - very interesting and extensive inventory in 39 albums and one sheet folder accommodated. Many covers and cards, nice frankings and cancellations to different topics, postal stamps including se-tenant and so on. Perfect for liquidation, very favorable! 3355 ⊙ Switzerland - 1938 / 95, extensive used collection, nearly complete in three Lindner hingeless printed form ring binder with a lot of better issues, with also all souvenir sheets including Pro Patria-block 1940 on cover, Federal celebration souvenir sheet 1942, Pro Juventute souvenir sheet 1941, LUNABA-block, the PAX set and so on. Very high catalog value! 3357 ⊙/ / Switzerland - rich collection from the classic formed in four albums with a lot of better issues, numerous early values, mixed quality, better souvenir sheets including NABA-block 1934 and much further material, also postal valid values and so on. Enormous catalog value!